I've got a bread baking machine since 2003 and it's 9 years already I am baking bread by myself. At the beginning I used and bought ready bread mix. But soon I discovered that the bread's never the way it looks on the picture and tastes strange. So I started some experiments and I invented my own bread recipe. You can use herbs or skip the sunflower seeds or the onions, but I like the taste of MY bread. If you don't have a bread baking machine - you can probably make the dough the way you would make a yeast dough. But it will take more time and energy to make it. 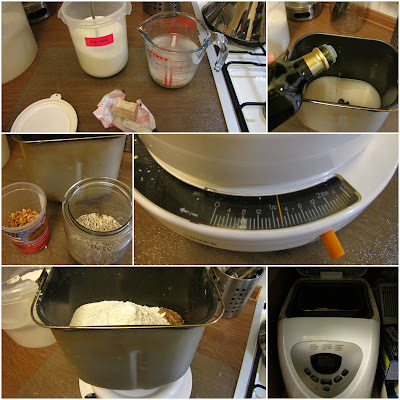 I like the bread baking machine because I really add the ingredients to the mixing bowl (which takes 5 minutes) and after 3 hours I take a fresh baked bread out. Now I would like to share my recipe with you - it is one of the recipes I could recite even if you wake me up in the middle of the night. And to all metric users: excuse that strange gram and ml specifications, but I always used the imperial system for this recipe. Use the "normal" programme of the bread baking machine (3 hours) with the "dark" option. After a while the machine will do it job check the dough with a spoon. If it is too dry, add one or two extra tablespoons of water. It depends on the flour. That's why the amount of water I wrote is the minimum you will need but I can not guarantee you won't have to add some extra. The dough should not be dry or too hard. It should have the consistence of chewing gum after you chew it for 5 minutes ;) - sorry I had no idea how to describe it. That's why I wrote, check it with a spoon and you will get the "right" feeling.